It's the time of year when birds are back on breeding territory or making their way further north, and singing along the way!! Want to learn who's doing the singing? 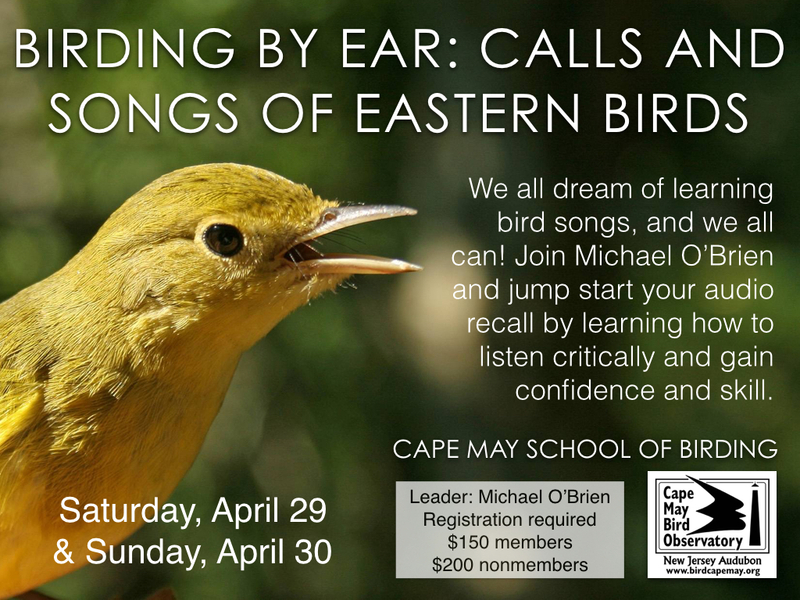 Join Michael O'Brien in discovering the songs of warblers, vireos, sparrows, and more on this Cape May School of Birding Workshop!! CMBO is once again taking part in the ReTURN The Favor partnership of conservation groups in rescuing stranded Horseshoe Crabs on beaches in Southern New Jersey. We have accepted responsibility for three beaches on the Delaware Bayshore - Cook's Beach, Pierce's Point Beach, and High's Beach - and are inviting you to join us in monitoring and assisting the crabs on these beaches. The Delaware Bay has long been the home to the largest concentration of spawning horseshoe crabs in the world, but this population has declined by 90% over the last 15 years because of overharvesting and degraded habitat. This trend is not only an issue for the horseshoe crab population itself, but also for migrating shorebird species that depend on the horseshoe crab for survival. In May and June each year horseshoe crabs use the Delaware Bay beaches to lay their eggs. At the same time shorebirds are migrating from South America to Arctic breeding grounds. To complete this journey - up to 9,000 miles long - shorebirds stop over in the Delaware Bay region to refuel on the high-calorie horseshoe crab eggs. As the horseshoe crab population struggles, the shorebirds are unable to fatten on crab eggs to continue to the Arctic. And now many of these shorebird populations - including Red Knots, Ruddy Turnstones, Semipalmated Sandpipers, Dunlins - are also struggling. 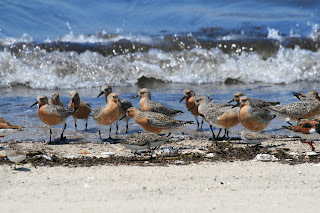 In fact, the Red Knot was recently listed as 'threatened' under the federal Endangered Species Act. You can help rescue horseshoe crabs in New Jersey through our reTURN the Favor program, keeping horseshoe crabs and shorebirds in the Delaware Bay for many years to come. The Issue: While coming ashore many of these harmless animals accidentally become overturned by waves, or become trapped in jetties or behind bulkheads. Horseshoe crabs are vulnerable when their soft undersides are exposed to the sun and are easy targets for predators. Thousands of horseshoe crabs die each season due to stranding on beaches. Please let us know if you are interested in this inspiring venture. By helping us to actively return Horseshoe Crabs to their proper side and assess the numbers on the beaches, you will be help the ecosystem as a whole. It's a great chance to make a difference! More information is available at reTURNtheFavorNJ.org or by contacting us directly. New volunteers should plan to take part in one of two training sessions being offered: April 20 at the Wetlands Institute (6-8 pm) or April 29 at the Bayshore Center in Bivalve (10 am -12 pm). 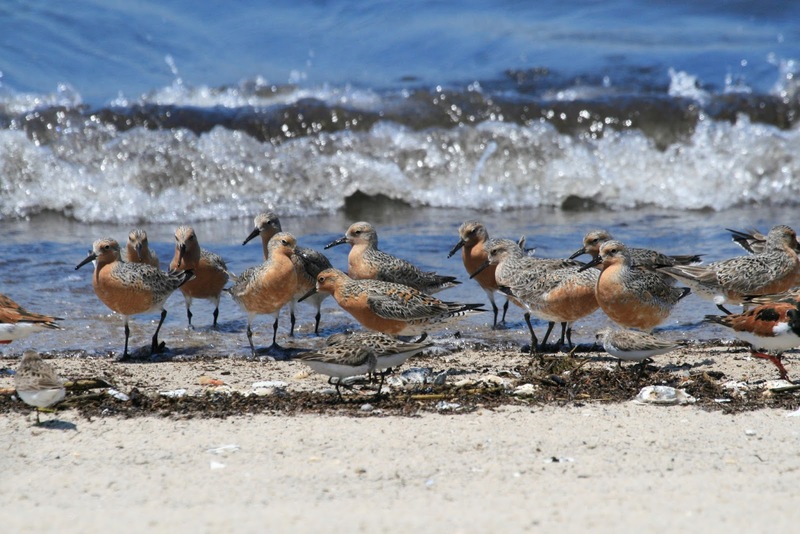 Our beaches are closed beaches, meaning no access during daylight hours between May 7 - June 7, to accommodate the feeding shorebirds. Monitoring during this period will require late evening/night walks. We will also host two public walks on June 9 (1-3 pm) and June 16 (9-11 am), starting with a short training session at the Center for Research and Education (CRE) along Rt. 47 in Goshen, before proceeding to one of our three beaches. RSVP to the CMBO registrar your intent to volunteer - cmboregistrar@njaudubon.org. Hope you'll join us!! Would you like to see a Northern Gannet? How about 8,000 in one day?!! That's what went by the Springwatch site in Cape May today (April 7th), along with 1500+ Red-throated Loons, 2300+ Black Scoters, 1500+ Surf Scoters and so much more!! 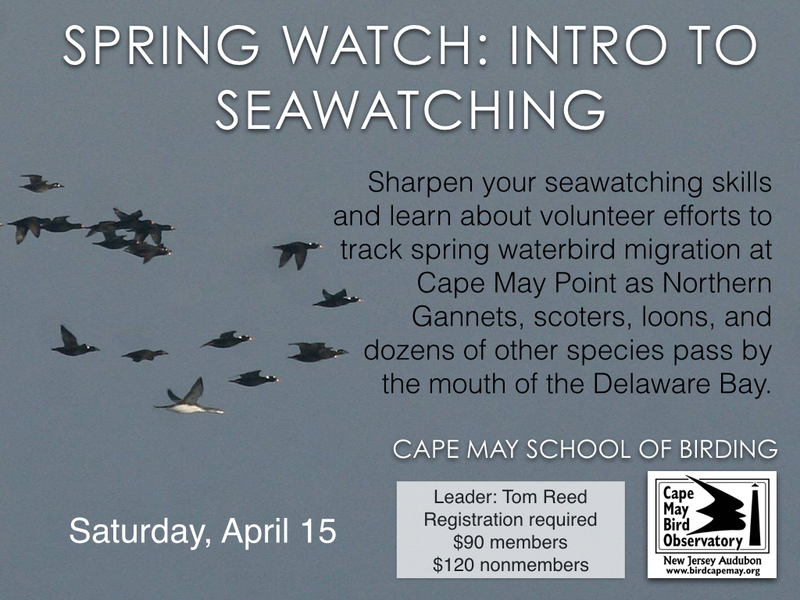 Join Tom Reed, Cape May's seawatch expert, for this Cape May School of Birding Workshop and a chance to learn how to identify and understand the amazing migration past Cape May Point. Many birders are aware of the significant autumn waterbird migration visible at the Avalon Seawatch, but far fewer know about the spring spectacle that occurs at the mouth of Delaware Bay. Northern Gannets, scoters, loons, and dozens of other species stage and migrate through the bay during their northward journeys. 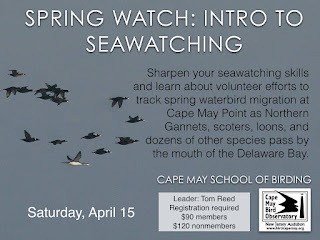 Tom Reed, CMBO's Migration Count Coordinator, has led efforts to monitor these happenings at Cape May Point in recent years. Join Tom for a morning session of seawatching, a great opportunity for beginners to dip their toes in this challenging but exciting birding activity! We’ll follow with an afternoon session that will reinforce identification tips while also introducing the history and goals of the “Springwatch” monitoring program. 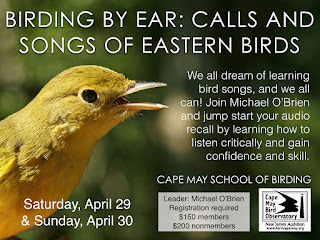 Join the CMBO CENTURY RUN World Series of Birding Team!!! 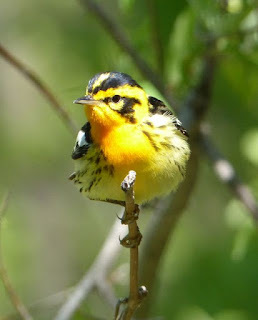 It's that time again - the 34th annual World Series of Birding! Soon, teams from all over the world will be scouring the marshes, forests, and meadows of New Jersey to count birds - and raising money for New Jersey Audubon's conservation efforts! At CMBO, we're once again hosting a team with open registration. This is your chance to join in the fun and camaraderie of a birding event, along with team captain Brett Ewald, CMBO Associate Naturalists, and Swarovski Optik’s Clay Taylor. We'll have a full and rewarding day of birding around Cape May County. We will start around 5:00am, with a later start for those who are not early birds. We generally bird until around 10:00pm, with a few breaks in between. The CMBO Century Run team is a level II team, so there is no registration fee required. However, by joining our team, you commit to raise $1 per bird species counted. Last year, our team tallied 134 species, and this year our goal is 140!. Thanks to your generous hard work and donations last year, our team raised over $7000. Help us to reach this year's goal of $7500, through a contribution or joining us in the field. We can make a difference together!!!!! For more information, to make a donation, or to register for the CMBO Century Run team, go to our team page at WorldSeriesofBirding.org. 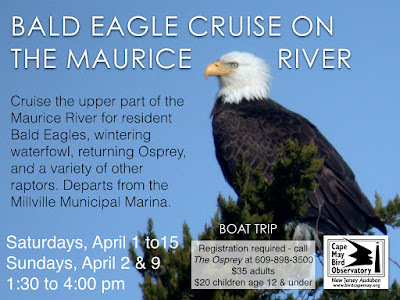 Bald Eagle Cruises on the Maurice River start this weekend!